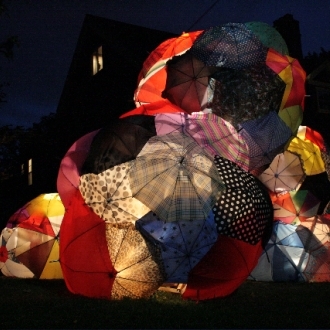 I'm thrilled to announce that I will shortly begin work on my newest umbrella installation, Drift, for Light City's BGE Art Walk. I'm thrilled to have this new work included in the BGE Light Art Walk, a 1.5-mile trail along Baltimore’s Inner Harbor featuring illuminated sculptures, projections, interactive technologies, pop-up performances, musical entertainment, locally-sourced food concepts and maker tents. Drift will be a site-specific installation in the canal between Piers 5 and 6. Umbrellas will cover three sailboats with to celebrate the deep natural harbor and the beauty of community while highlighting the importance of boats to Balitmore’s history. At night, lights beneath the umbrellas will cause the sculpture itself to glow, creating colorful reflections on the water.